Some of the comics folks I like best will be at both Baltimore Comic-Con AND SPX this year, so here's a week of double-spotlights! You can find all of my SPX Spotlight posts, including those from past years, by clicking here. You can read all of my Baltimore Comic-Con Spotlights here. If I ever sat down to make a list of my best comics impulse purchases, Rafer Roberts' Plastic Farm might very well top the list. I grabbed a copy of the first trade on a whim, based on a love of horror and a developing preference for trades over single issues. It was slightly more expensive than I usually grab without a smaller preview, but it ended up being well worth it. 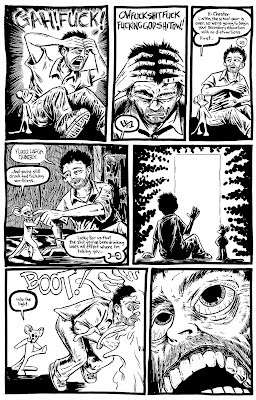 For those unaware, Plastic Farm is the epic comic story of a man's descent into insanity. But that's not all. His strange mental issues are affecting others in innovative and terrible ways, which is chronicled in every issue. Weaving in and out of storylines that slowly tie together, Roberts has a master plan that continues to unfold as time goes on. Plastic Farm is not Rafer's only comic, however. He frequently works in anthologies, so you may have seen him in something like the best-selling FUBAR 2 collection or the free tabloid Magic Bullet. Rafer also has a gallery exhibition in Rockland, Maryland, showing off his artistic chops in all their full-size glory. In all of his work, whether it's a Kirby pastiche or an EC-comics style mini, Roberts has a distinctive style that's instantly recognizable. I've been reading Rafer's comics for a long time now (starting on a business trip where I imagined someone walking in on me mid-Plastic Farm and deciding I immediately should be fired), and watching his style progress and improve has been a great pleasure. While even the earliest issues of Plastic Farm are better than the average mini-comic (especially a horror mini, where it seems people think tons of gore and violence can trump actual illustration), seeing the change is striking. Rafer always played with layouts and a heavy use of carefully drawn lines that work to either compliment or contrast each other, but over time, he's been able to make any line do his bidding. Like a pointillist painter with dots, Rafer's lines change their shape to fit whatever he chooses, such as the examples from this page of Plastic Farm 21, which is a Panel Patter exclusive! Look at the intricate hatching in panel four on the walls that contrasts with the inking on the floor. Meanwhile, panel 7 provides intricate and terrifying details of Chester's pain, from his bloodshot, wide eyes to the caverns of his teeth. We even get a little Kirby Krackle in panel five. 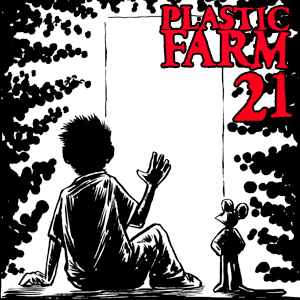 For SPX this year, Rafer will have the 21st issue of Plastic Farm ready for sale. (I do not think it will be available in time for Baltimore.) In addition, he will have the first Plastic Farm trade (which comes with a Panel Patter recommendation) as well as single issues from the series if you want to sample the book before committing to a larger edition. (I can almost guarantee psychological horror fans who aren't afraid of a bit of gross-out here and there will be back for more.) Rafer also has sketch cards and original art for sale, if that's your thing. Anyone who loves horror and great linework needs to stop by Rafer Roberts' table, either at SPX or the Baltimore Comic-Con. As his character himself says, "this is the weirdest crap ever"--and I wouldn't have it any other way. Can't make either show? You can visit Rafer's website and store here.